Our Nurse Geriatric Case Managers can help your families who are struggling. Let us be the single point of contact needed to connect the dots, put a plan in place and provide guidance and support. The goal of a Life Care Planner is to provide guidance and education to seniors and their families, to promote and maintain optimum health, safety, dignity, independence, well-being, and quality of life. Adverse Drug Events ARE Preventable! In the U.S., almost 40% of people age 60 years and older take at least five medications. Although only 14% of the U.S. population is 65 years of age or older, the elderly account for about 25% of emergency department visits due to adverse drug events. Adverse drug events account for nearly 700,000 emergency department visits and 100,000 hospitalizations each year. When children of seniors reach out to us, they are typically in a downward spiral. We always reconcile medications. I estimate 90% of our clients have side effects caused by: interactions between medications, the senior is not taking their medications correctly, or they have prescriptions that are inappropriate due to physicians not in communication. Once adverse drug events are identified, many individuals improve by simple interventions. Physicians Not in Communication For example, you have a physician ordering blood pressure medication and a cardiologist ordering medication. The two physicians are not communicating so the error goes unnoticed. 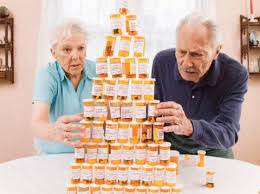 Interactions from Polypharmacy If a senior does not know the side effects of taking multiple medications together, they do not know to notify the physician of symptoms. Symptoms such as drowsiness, confusion, depression or falling are a few side effects we have seen that people attribute to old age, but are really related to too many medications. User Error Perhaps the senior has confusion either from dementia or from polypharmacy as described above. Multiple medications are hard enough to keep track of for someone of anyone age, let alone someone with even slight confusion. Always look at how organized the person’s medications are, ask how they take them and observe. You can learn a lot by just watching. Keep a List With You at All Times See attached form. Print this off and keep in your wallet or purse. Update each visit to the physician. Use the Same Pharmacy (We Like Exact Care) Exact Care uses bubble packs that are delivered to the door one month at a time with days’ worth of medication individually wrapped. A social worker or nurse comes to the home and reconciles all medication before changing over and can catch errors, and decrease chance of future errors. Use a Medication Reminder System There are many apps out there for reminders, but can be confusing for an older adult. Go to Amazon.com and search for “med-e-lert”. For around $70 you can purchase a machine that locks and will beep when it is time to take the medication. Helpful hint… I would totally use this if I had medication. It is good for any age! Check with Interaction Checker at Drugs.com Never self-regulate medications. Become knowledgeable by going to a source and entering in medication, looking at side effects and ask your physician about these effects and the cost/benefit of continuing or stopping the medication. Facility Spotlight The Ganzhorn Suites 10272 Sawmill Parkway Powell, Ohio 43065 (614) 356-9810 Did you know we help families find facility placement? We are paid directly by the family, NOT the facility, so our opinions are always in the best interest of our clients. Ganzhorn Suites specializes in memory care. The care we have seen here is superb, and since they only deal with memory problems, the staff is well equipped to deal with the special needs that seniors with all types of dementia face. Take a tour and let them know we sent you. They are however 100% private pay, but if your loved one is not going to be Medicaid eligible, it is a great choice in the Columbus area. We have not seen any wait lists at this time. Tour it today.